Yesterday I turned 32! Yippee? It wasn’t a big celebration, I had planned on chips & pie for tea (yup rock n roll) but being quite lazy, the chip shop doesn’t deliver so I choose pizza, who do deliver. (This is very shameful, as the chip shop is about 1 minute walk away, with children) But it was a lovely candle lit dinner, as a friend had given me some candles for my birthday, and the pizza was very nice. I didn’t really get, or treat myself, to any sporty type birthday gifts. (unless you count the motivation to run from eating ALL the pizza (and wedges and garlic bread)) The one thing I did get was SEASON 2 OF ZOMBIES RUN! I honestly have not been as excited about going out to run as I am today, for a very long time! I might even switch Zombie Chases on! I thought I’d already blogged about how awesome this app is, but a quick search of the blog doesn’t throw up any posts, so expect one in the next few days. Because it is awesome! 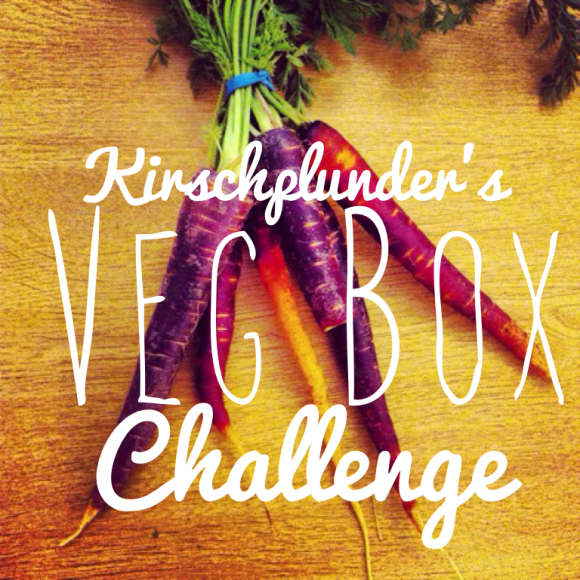 I’ve also joined Kirschplunder‘s #VegBoxChallenge! I think the name says it all, but you should head over to Johanna’s blog (http://kirschplunder.wordpress.com) if you want all the details, also if you get there before Friday night, there’s the chance to win a £20 Abel & Cole voucher, make sure you check out the post from 13th April for details! My 1st box is arriving Friday, so expect Instagram photos of odd shaped veg, and tweets asking for help, as my normal approach to cooking veggies, is either to blend it into soup, or to roast it with garlic and chillie. Are you going to join? or have any top tips for being inventive with veg boxes?